Well, all right, maybe identity crisis is a little overly dramatic. This entry was tagged careers, professional development, research. This entry was tagged professional development, STEM education, STEM pipeline, URM students, women in science. I have had versions of this post topic rattling around in my brain for many months. There are various reasons for me not writing it but ironically probably the biggest one is that I am unemployed. This entry was tagged applying for jobs, careers, funding, job searches, professional development. Has Small Pond Science helped increase broader awareness and respect for university scientists and students working outside the R1 environment? This entry was tagged blogging, change, communication, community, professional development, social media. A recent conversation* on twitter made me think about academic customs. The conversation centered on PhD comprehensive exams (PhD candidacy in the US system that happens about halfway through the PhD) but applies to all gate keeping parts of a PhD (or Masters) program. These can vary a lot between countries, universities and even departments (I wrote about the defence a while back). But this conversation was basically about how these hoops/tests can drift towards a hazing function rather than a learning or career building function. Let me just get my opinion out from the first. I don’t think hazing is useful, respectful or professional. Full stop. This entry was tagged grad school, grad students, happiness, professional development, training. I just had the pleasure of spending a couple days hiking around the interior of Catalina Island. The last time I did this was about 23 years ago, when I was a student on an undergraduate field trip for a course in Conservation Biology. This entry was tagged careers, deadwood, driftwood, professional development, research strategies. There are a bunch of life skills that come in handy in academia. Some are obvious and discussed a lot like time management, setting goals, getting stuff completed, etc. Others fly under the radar but maybe shouldn’t. One of those things is how you handle competition. Academia is one of those careers where competition is constantly part of the gig. As much as collaboration can be an essential part of success, there are also winners and losers throughout. The competitions vary but all of us fall on both sides of the line at least some of the time. This entry was tagged careers, happiness, professional development. We need to ditch the “academic pipeline” metaphor. Why? The professional destinations of people who enter academic science are necessarily varied. We do not intend or plan for everybody training in science to become academic researchers. This entry was tagged careers, communication, professional development, STEM research, underrepresented students, women in science. Last Friday there was a PhD defence in our department and Terry’s post about open defences in the USA got me thinking about the different cultures surrounding PhD defences. The first thing that came to mind is how different they can be, from country to country, university to university and even from department to department within universities. So, why so much variation? When I started writing this post I realised that I don’t have strong opinions about how a PhD defence ‘should’ be. It seems to me that there are lots of different and equally good ways of awarding PhDs. What constitutes ‘good’ will likely vary a lot based on how the entire program is formulated. But seeing different traditions now in Sweden has opened my eyes to some of the benefits of doing things differently. And thinking more seriously about PhD defences has gotten me thinking about the broader potential impacts of the event beyond being able to call yourself Dr. afterwards. First maybe I should lay out my own experience on the table so that my biases are in the open. I have a degree from the USA and so my defence went something like this: I handed in my dissertation to the committee that I had throughout my PhD a few weeks before the day, I gave a seminar (50 mins) on my research to the department and answered questions, then I went into a room with my committee and talked with them. They sent me out of the room and talked about who knows what while I waited (the time went on forever…). Then they brought me back and congratulated me (hooray!). I think I might have been told that an open defence was illegal somewhere in the planning but honestly with juggling a baby, an international move and finishing up, that time is a bit hazy for me…. What I liked about the process that I went through is that it gave me a defined goal to work towards for ‘finishing’ writing. In my department you only print bound copies of your dissertation after the defence. That means there is still more to do and you need to incorporate changes that your committee suggests. But the seminar gave me a chance to communicate with my department and let them know what I had managed to do in my time there. So although it was a little stressful, I appreciated having a defence rather than not. I think I benefited from doing mine. It was the first full length seminar on my work, for example. And getting through your defence is definitely something to celebrate. I’m not sure what it would have been like to have an open defence. The ones I’ve been to so far here in Sweden are much more focused on the details of the papers included in the dissertation. To be honest, I didn’t really feel like I was defending anything in my ‘defence’. In fact, my yearly committee meetings were always much harder and challenging than my defence and that wasn’t a bad thing. It made sure that my progress was going in the best possible direct rather than challenging details after it was too late to change them. So my committee and I talked very little about my dissertation but they focused more on big picture ideas. It was a really a great conversation that got me thinking about my place in science and how I could contribute. I think I’m still learning that but it was a wonderful broadening conversation. I was definitely asked some challenging questions in that closed-door portion of the defence, but I wasn’t actually defending my specific papers as I’ve seen more recently. Even in my former department, I think what constitutes the defence varies a lot between students but I appreciated the form mine took. One thing I think I might have missed out on with an internal defence with my committee is that I didn’t get a chance to have an in depth conversation about my work with someone from the outside. Watching the defences here in Sweden, I am beginning to appreciate how valuable that can be. I know of a number of people who ended up doing a post-doc with their external reviewer. It seems like a great way to meet and interact with a leader in your field and also gives them a chance to get to know you. I also know of another example of a paper that came out of discussions during the defence. Generally the process seems like a great way to connect with someone and in our department the external examiner also gives a presentation about your work to put it in a broader context. In a way, this gets them to be an advocate of the student and really get to know their work. So even if future collaborations aren’t an outcome, you’ve had someone new think deeply and carefully about your work. However, if I had an external examiner for my own defence, I don’t think I would have had the same kind of interesting conversation as I did. It could have been just as good but likely pretty different. What are the traditions at your department? Are there active discussions about what could be broader outcomes of the process of the PhD defence (besides a point where you can pass/fail a student)? And please share more extended outcomes of the PhD defence process! I’m sure I’ve only scratched the surface in this post. This entry was tagged grad school, grad students, professional development, training. Invited seminars and job interviews offer a unique opportunity to learn (and remember) what grad school is like and how universities work. You get to have a lot of intentional sit-down conversations on a wide variety of topics. Spending time meeting new people and learning new stuff rocks. And when you chat with other people about themselves, and their work, labs and universities, you have a chance to put your own way of doing things in perspective. I’ve had a few such opportunities in the past month. There were a number of recurring conversational themes and undercurrents. During these visits, you get to have conversations to learn not just about all kinds of research, but about how people chose the directions that led to their current trajectories. And, you often learn about how personal lives shape our research directions and priorities, both by design and by hap. Research universities are no longer primarily oriented towards training excellent scientists. They are now primarily oriented towards teaching students how to publish and to get grants. If a grad student develops the desire to become an excellent practitioner of science, this is probably going to emerge from the undergraduate experience. Anybody currently building a future in the quantitative sciences needs to learn how to write code to promote their own research success. Being able to manage and analyze super-duper huge datasets (bioinformatics) is really useful. High quantity data will never be a substitute for high quality data. People need to get off their goddamn phones. Genomics is now at the point when all flavors of biologists are in a practical position to figure out heritable mechanisms accounting for phenomena involving organisms in nature. For many kinds of questions, any species can now be a model system. Most ecological theories are ephemeral, and are either myopic or wrong. The parenting of popular, ephemeral and myopic theories is the prevailing route to success. It’s difficult to maintain the presence of mind to recognize the power of one’s own authority. In ecology and evolutionary biology, women fall out of academic careers most heavily in the transition phase between from Ph.D. to faculty. Lots of parties are at fault, but the ones that seem to be the most significant are some senior faculty (of both genders) and some spouses. Deans have many opportunities to proactively make positive changes, but that rarely happens. The number of students who want to do serious, long-term, field biology in the service of contemporary research questions has sharply declined. This limits our potential to answer some major wide open questions in biology. Universities that maintain a strong faculty actively keep their professors from going on the market in search of greener pastures. Universities would not lose valued faculty members as often as they do, if they actually supported faculty commensurate with the degree to which they are valued. Once someone is driven to look for a new faculty job on the market, then it’s impossible to not take a great offer seriously, even when there are many good reasons to not move. The beauty of life – both in biodiversity and our relations with fellow humans – is immense beyond words. Humanity might be ugly, but people are gorgeous. This entry was tagged careers, field research, grad students, minutia, professional development, research strategies, travel, undergraduate research. Teaching Tuesday: How do ecologists teach and are there barriers to change? To follow up everyone’s favorite teaching tools, I want to dissect a little more what ecology teachers are actually doing in their courses. 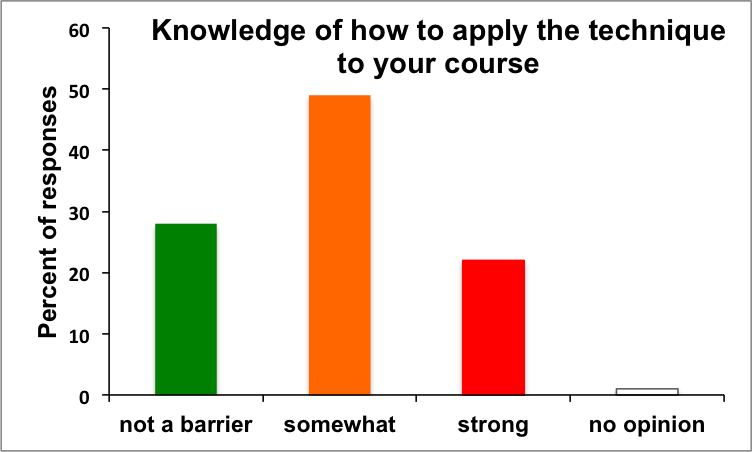 The majority of respondents were basing their answers on what they are doing in undergraduate courses (43%, introductory and 43% upper level). First, I wanted to tease apart the time spent lecturing by teachers and the amount of course time students spent listening to lectures. There is a lot of evidence out there that simply listening to lectures is not an effective way to learn, but I wanted to assess how common it actually is for students to only listen to lectures. Because ecology courses can often have separate sections for labs/field work and these might be taught by different people (teaching assistants, for example), I thought it was useful to contrast the teachers’ role from the students’ perspective. 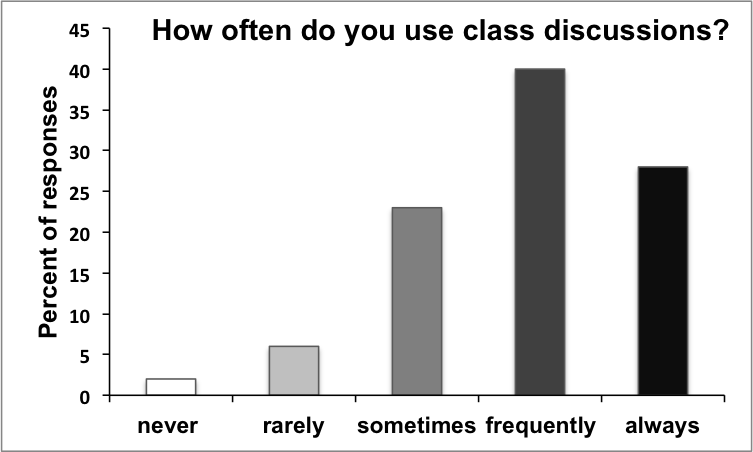 Following are the answers to: What percentage of your in-class teaching time is spent lecturing? 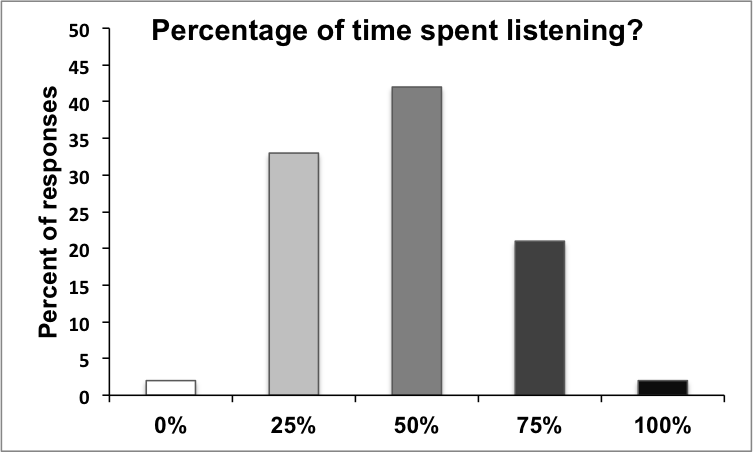 and For your students, what percentage of your course is spent listening to lectures? 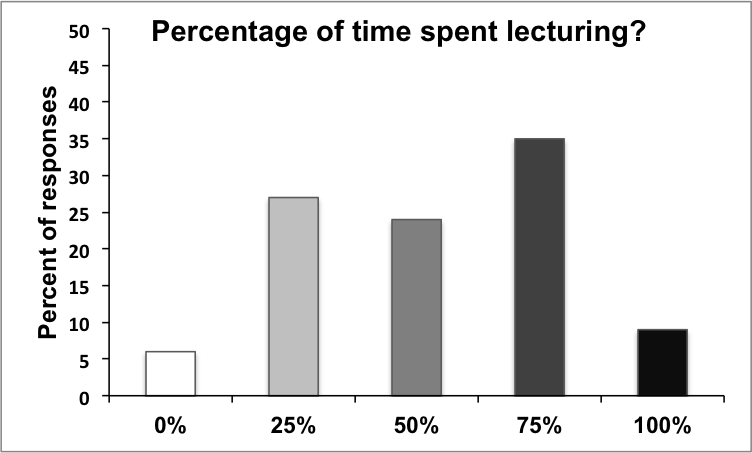 Indeed, students seem to generally spend less time in lectures than the teachers are lecturing, suggesting that students might be getting some of the non-lecturing time with other instructors/teaching assistants. 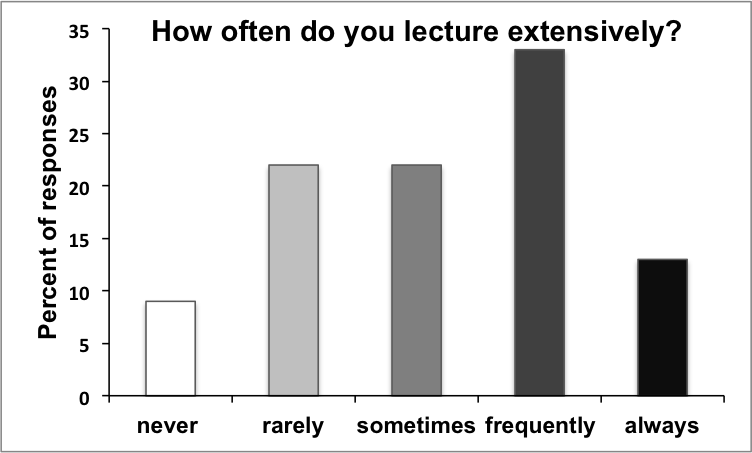 But just to be sure, I also came at this question from another angle and asked how frequently teachers used extensive lecturing. 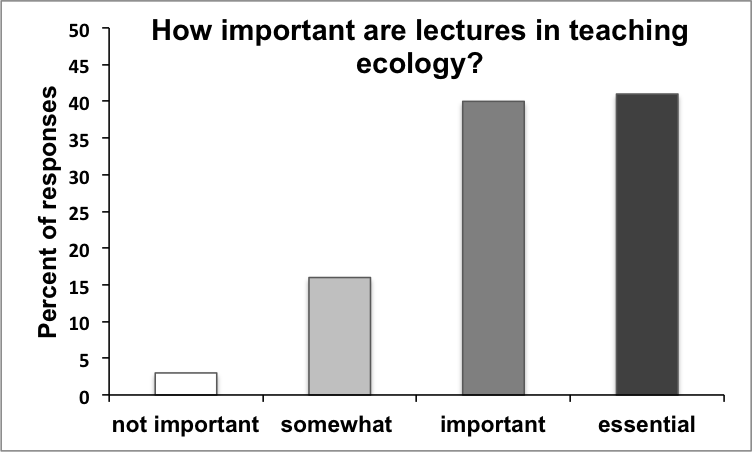 Many do frequently use extensive lecturing and the majority think that lecturing is important or essential for teaching ecology. There is a lot of lecturing going on in ecology classes, likely because the teachers think it is important but there is also obviously more to the story. So what is happening when teachers aren’t lecturing? 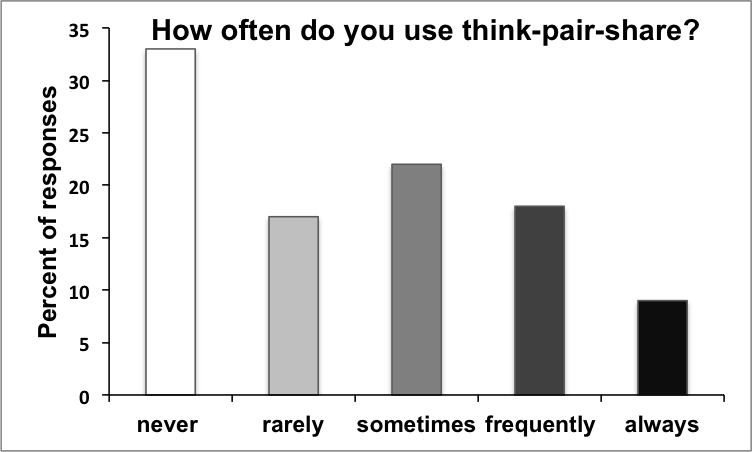 We saw last week, few ecologists are using clickers in their courses but think-pair-share (basically getting students to talk to each other about an issue before a larger class discussion) was mentioned as an effective teaching tool. There are a number of people using the technique, but about half are basically not. However, I think that there might be a bit of skewing here because some might actually use similar techniques without realising there is a name for it. 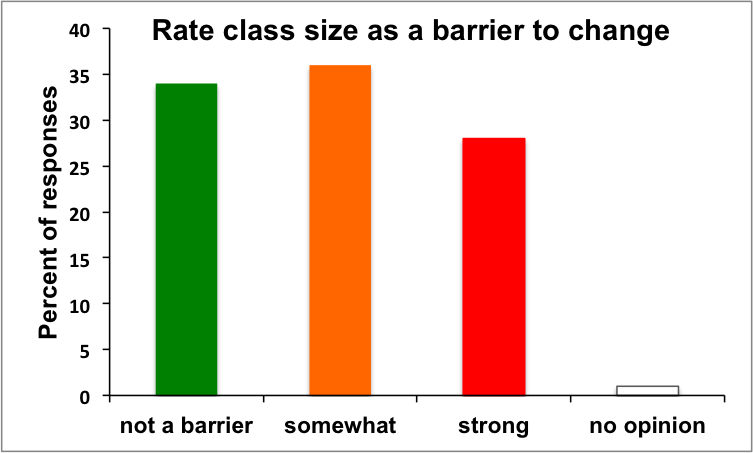 Although it is impossible to know specifically what kind of class discussions these include, the majority of ecology teaching does include class discussions. 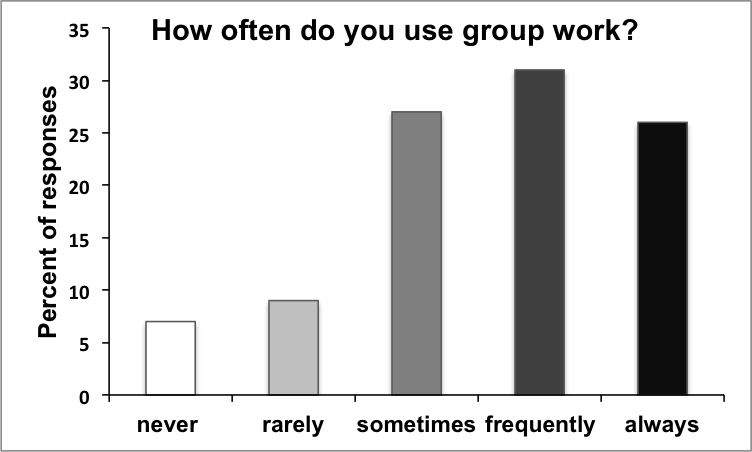 Further on the theme of students talking to one another, group work is common, and a similar pattern was seen in the answers for cooperative learning. Therefore, ecologists are getting their students talking and learning from one another. Letting students decide course content is not common but interestingly, it is not unheard of in ecology classes. 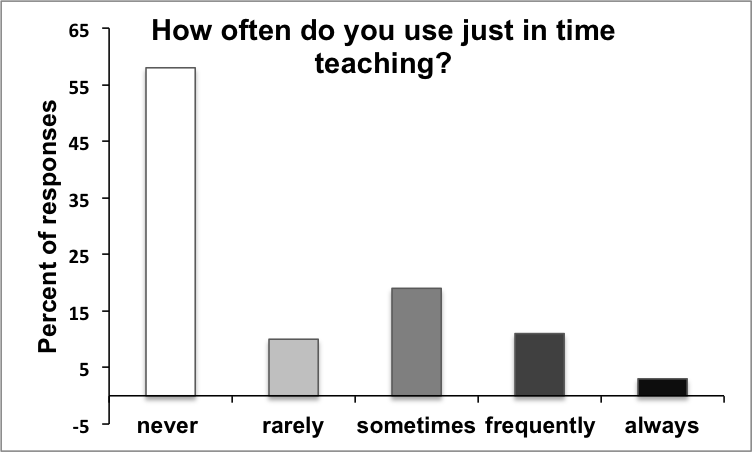 Almost half of the people said students select topics at least some of the time and about a third occasionally use just-in-time teaching. I expect in line with many of our experiences, ecology instruction involves quite a bit of lecturing but this is spiced up with other activities. 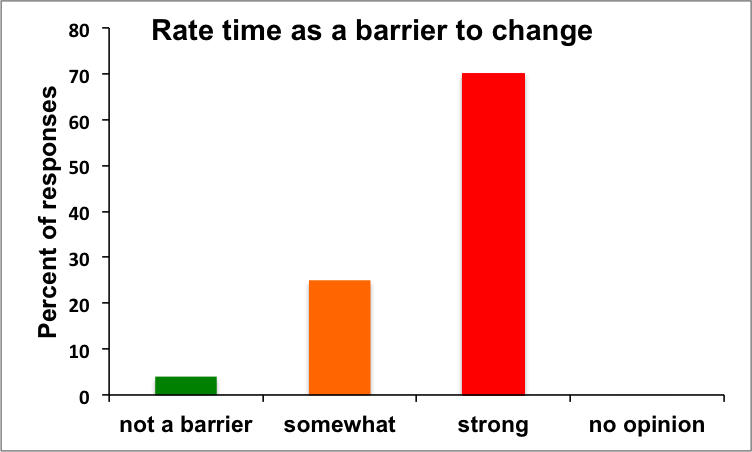 But say that you wanted to change the way a course was run or try a new technique, what are the biggest barriers for ecology teachers? Well, I’m sure that this won’t be a shock but it comes down to two basic things: time and money. What about the classic stereotype that ‘professors’ (in quotes because the survey includes different positions involved with teaching) don’t care about teaching and just want to do research? 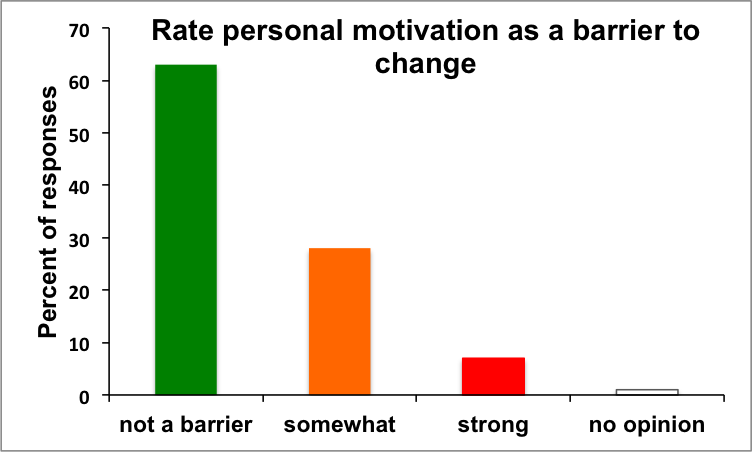 With the strong caveat that people who take time out of their day to answer a survey about teaching may have some strong opinions about teaching and be personally motivated to change/try new things, personal motivation is not a strong barrier to change. (Or, you could take the negative view and say that people won’t admit that it is.) 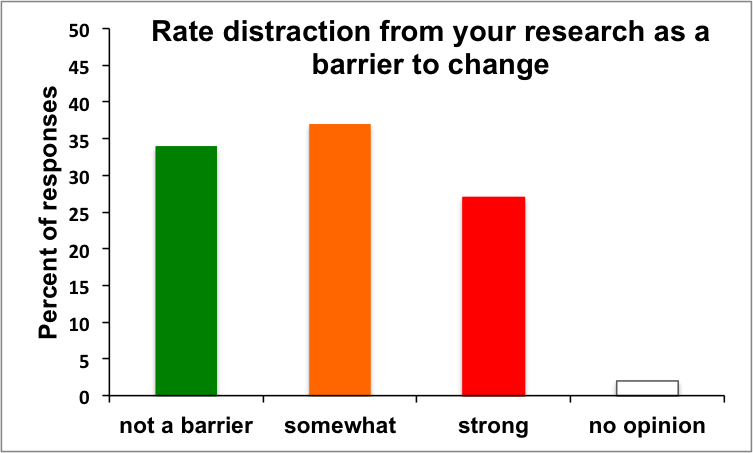 Probably related to the time issue, distraction from research is seen as a stronger barrier to change than personal motivation. Time invested in one activity must come from somewhere, thus a somewhat classic tug-of-war between teaching and research can occur. However, if people had more access to the logistics of trying a new technique and knew better how to make that efficient, than perhaps changing teaching styles/techniques wouldn’t be such a time sink. As a commenter on last week’s post said, maybe we shouldn’t be reinventing the wheel for every course but instead can learn from one another. 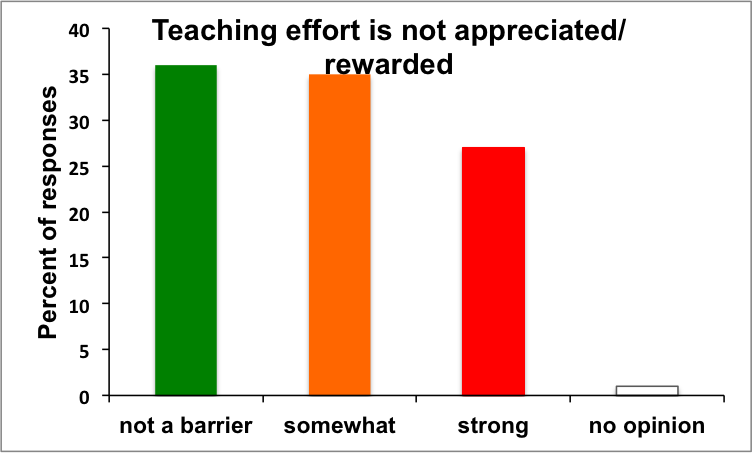 But here is the real kicker: if teaching effort is not appreciated or rewarded, than it becomes harder to put those activities to the top of your list. Of course, there is a bit of circularity here. If teaching is appreciated by your department/university, than they will likely also invest in ways to create time and resources, including training, for their teachers. But for those with limited time, resources and appreciation, it is not surprising that people continue to teach as they have in the past. I definitely got a taste of this with a course I was asked to teach. Everything happened fairly last minute with changes to the course leadership and teachers (including me). Given that I didn’t have a lot of time to prepare, I generally followed the previous lectures and activities given in the course. Now I am looking for ways to improve my section of the class but of course, it would take up much less of my time if I just retaught the way I (and those before me) have done before. 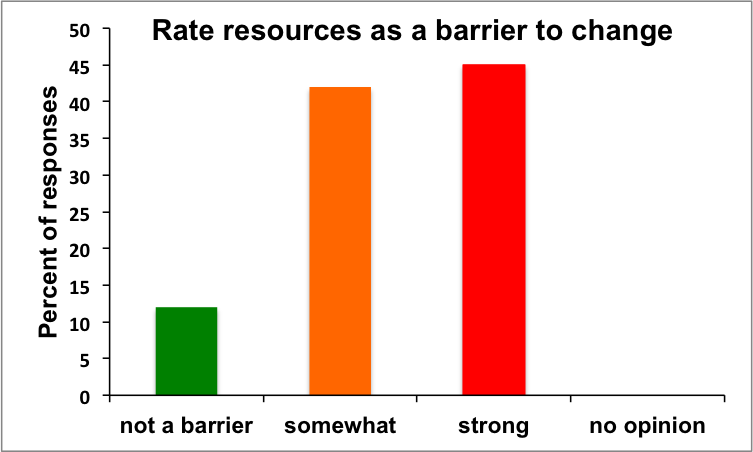 Despite some of these challenges to change, if this survey is any indication, ecology teachers are doing some innovative things with their classes. Up next week (if I can manage to get some time to write surrounding the pollination conference I’m attending): Writing in ecology. This entry was tagged efficient teaching, professional development, resources, teaching, time management, undergraduates. What is to be gained by inviting and hosting a seminar speaker? There are institutional advantages to running a seminar series: to promote an intellectual atmosphere in a department, build a diversity of viewpoints, train students and keep everybody current. However, when an individual person or laboratory decides to host a particular guest speaker, there are other primary motives at work. Here is a non-exclusive list of goals of hosts, that could explain why certain speakers are picked for a seminar series. Schmoozing for a postdoc. I think this is the main reason that speakers are invited. Grad students want to be able to land a postdoc, and PIs want their students to land postdocs. Bringing in potential postdoc mentors to build relationships with graduate students is an old tradition. Hang out with your intellectual hero. There’s something special about academically famous people in your field. The chance to visit just have a coffee with, say, Bert Hölldobler or Dan Janzen would be mighty darn cool. When I was in grad school, one person I invited was Ivette Perfecto. My main motivation was because because her science is just so darn awesome, and the chance to hang out with her was tremendous. Quality time with a friend. Wouldn’t it good to see an old pal you haven’t seen for a while, and catch up on what work they’ve been doing? Being an alpha. Hosts could invite junior speakers in their same field which are sure to be flattering of their more esteemed hosts whom they are visiting. Be a beta. Hosts could invite senior researchers in their field, upon whose feet they may grovel. How is this different from hanging out with your hero? Betas are looking for status and opportunity, while it’s also possible to invite someone for less careerist motives. Develop the career of another scientist. It could be that you just want to give an a good experience to a junior scientist who does good work, who could stand to benefit from giving an invited seminar. Work with a collaborator. Some work is a lot easier, or more effective, when you’re in the same room, rather than using various methods of remote communication. Why not bring your collaborator out on the department’s dime? Build a culture of inclusiveness. It’s no accident that most visiting speakers that I invite to my university’s lecture series are early career women, often with an international background or from underrepresented groups. This helps promote the careers of these scientists who are at a structural disadvantage because of biases in the system. An even stronger motivation, from my standpoint, is that these speakers are inspirational role models for our students, most of whom are minority women. I can talk about a commitment to diversity until my white face turns blue, but the fact of who I am speaks more than my words. Regular exposure to the experiences of senior doctoral students, postdocs, and junior faculty who have backgrounds not so different from my own students are critical. This isn’t the only factor involved in extending an invitation, but it’s a big one for myself and others at my institution. Trade favors. Bringing a speaker out might be to make someone owe you a favor or a way to repay a favor. This could be to help out someone’s postdoc, or help out someone with a shaky tenure case who could use a bit of external validation. This might sound like a silly motive, but not without precedent. Once, when I was organizing a symposium, someone asked me for a speaking slot, and if I did this favor, this person said that I would be invited for the seminar series. Show grad students a variety of career options. The flawed default mode in many universities is that moving onto an R1 faculty position is the natural and expected progression after grad school. However, the majority of Ph.D. recipients don’t go this route. Inviting people who work in industry, NGOs, and governmental agencies can help broaden perspectives. Also, of course, you could invite a researchers based out of a teaching institution. This will definitely widen the job horizons of grad students. Entertainment value. Some people are invited because they’re known for giving a really great talk, will fill the house, and will bring not only reflected praise on the hosts but also a good time. Learning science. Some people actually invite seminar speakers because they want to learn about the science that’s being done by the guest. And that’s it for the list. Feel free to add the ones that I’m forgetting in the comments. Or to tell a funny story, for that matter. We could use more funny stories in the comments, right? This entry was tagged collaboration, communication, grad students, postdoc, professional development, reputation, seminar, underrepresented students. What is the purpose of an invited seminar? Everybody wants to give a great seminar. But when the speaker gives the talk, what is the purpose or goal of the talk? What is the speaker trying to accomplish? The purposes of dissertation defenses and job talks are obvious. However, whenever an invited speaker comes to give a seminar as a part of seminar series, the speaker could show up with many different kinds of priorities and purposes. We all have a variety of motivations that are context-dependent. Visiting speakers have overt and tacit messages that they have designed to be delivered in their slightly-less-than-an-hour timeslots. Here is a classification of the non-exclusive goals that speakers might seek to accomplish in a seminar. Build a reputation as an important scholar. Seminars can be used to help the speakers grow the perception that they, and their work, are important. To some extent the invitation to give the seminar itself is a validation, but the delivery of the talk is required to cement that validation and help people spread work. Being an alpha. Some speakers know that they don’t need to build their reputation, but they can use the time allotted to them in a seminar to assert their dominant status. These talks might be used to stake out territory of interest to people working in the institution sponsoring the visit. Be a beta. If the visiting speakers were invited by more prestigious research groups, then the speakers might choose to demonstrate behavioral submissiveness to the dominant hosts. Bask in one’s legacy. Some speakers don’t want to say anything particularly new, but want to use the time to provide an overview of the major accomplishments that have been made over a successful career. Promote students and postdocs. Seminar speakers are often invited to be the schmoozed, but they also can use seminars to promote the work of the members of their own labs. These kinds of talks heavily feature the roles of lab members in work presented in the talk. Be entertaining and have fun. Some talks are designed to entertain the audience rather than inform. Moreover, the speaker could be giving the talk just for the fun of it. Show off smarts. On some occasions, the speakers just want to show off how smart they are. This is likely to involve a number of obscure details that the audience wouldn’t want to bother understanding. Not embarrass oneself. The imposter syndrome is well described in academia and speakers might not recognize that they are up to the task or are worthy of an invited talk. Other speakers might feel great about their science but are not sure that they can give a great talk. So, just getting through the talk without screwing up might be a goal of its own. Build collaborations. When scholars visit one another’s institutions, the social context and resource access can facilitate collaborations more readily than what might occur at a professional conference. The seminar might be constructed to demonstrate opportunities where collaborations could be most fruitful. Recruit students or postdocs. Faculty should always be on the lookout for motivated and talented future lab members. If there are potential recruits in the audience, the talk could serve not only as inspiration but also communicate clear possibilities for exciting student projects. Give a lesson or advocate for an approach to how science is done. Oftentimes, seminars are most interesting not because of what was learned, but because the person presenting the work explained their rationale for choosing their experiments and provided arguments for the effectiveness of their approach to doing science. Speakers might choose to use their talk to give a lesson about more abstract ideas about the best ways to do science. Argue for or against a pet theory, or shape the future of the field. Speakers might not be so heavily focused on their own findings, but instead use the seminar to advocate for or against a broader theory or direction for the field. Pick an unnecessary argument. Some people are inherently antagonistic. They might think so strongly that the advance of knowledge emerges from arguments among academics, that they pick arguments and intentionally say controversial things to get the ball rolling on arguments. Be cool. Some people need to show that what they are doing is cool. Obviously this purpose could overlap with other purposes, such as building a reputation or having fun. But sometimes, being cool is most important. Inspire a new generation of scientists. Some speakers design their seminars specifically to be inspiration for the grad students in the audience. They might not be working hard to market their own ideas, or promote themselves, but to provide guidance for the junior scientists. Actually give a science lesson. This might sound crazy, but some people design their talks so that they are giving a lesson about their own scientific research so that people can understand more about the world. And that’s it for the list. And, I’d be dishonest if I ignored the fact that giving a kickass talk makes one look good in the professional arena, which has practical long-term career advantages. It’s all a part of the dumb sociological game in science. While we can pretend to transcend the game, we are on the game board whether we like it or not. Later this week, I’ll be considering the various priorities that people have in mind when hosting a visiting speaker. This entry was tagged careers, collaboration, communication, happiness, professional development, seminar. This isn’t a real post but rather a heads up for the coming weeks. As a part of a course on scholarly teaching I took last winter, I began to think more deeply about teaching styles and techniques. I was finding a stark contrast between what I was discovering about effective teaching and learning and the experiences I had as a student or a part of the teaching team. So for my project in the course, I decided to ask ecologists about how they were teaching and why. I created a survey (link still active here if you want to add your voice: teaching survey) and sent it to as many ecologists as I could reach through various list serves, facebook and twitter. I summarized a portion of the results (from Swedes) for a teaching conference at my university in the spring but haven’t had the chance to share the dataset in its entirety with the ecology community and especially those that so kindly took the time to answer the survey. This blog seems to be the perfect venue to share the results. And so I begin a series called Teaching Tuesdays. Over the coming weeks I will share the insights into ecology teaching and practice I’ve gleaned from the survey. Hopefully I will succeed in summarizing the data into some digestible chunks. Before I start the series, I want to acknowledge all the people who took the time out of their busy schedules to fill in the questionnaire. I truly appreciate the generosity of the ecological community. Without you this would not be possible! 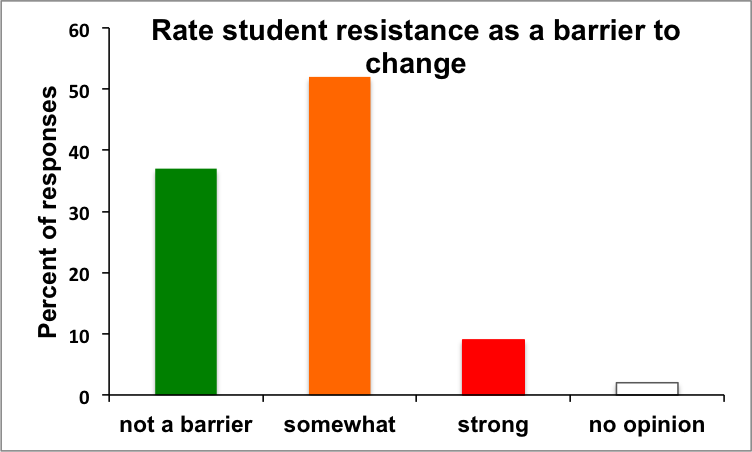 Next week: What do ecologists find difficult to teach? This entry was tagged Ecology, efficient teaching, professional development, teaching, undergraduates. I’ve always disliked the phrase “deadwood” when referring to a certain class of senior faculty. It’s disrespectful. The term exists to identify a set of negative characteristics, after all. I used it in an earlier post, addressing how I’ve gotten a bit stale. Nobody seemed bothered by it, at least not that I heard. I’m not personally opposed to the term, though I’d be very cautious in using it. I used it describing my potential fate, and a former professor of mine who fit the bill. In a comment, Jeremy Fox (of Dynamic Ecology) had some questions and insights into how we may not be able to diagnose the process. On reflection, I realize that very few faculty are genuine deadwood. You’re deadwood if you do nothing but the minimum, you don’t care, don’t even try, and just show up for the paycheck. You don’t prepare for class, you don’t even attempt to do research, you barely show up at meetings and you duck all service, unless it gives you a chance to be overbearing. That’s deadwood. These are faculty who have let their careers drift without conscious planning. They want to do a good job, but they haven’t kept up the skills to keep relevant. The research world has moved past them, and they aren’t familiar with the current literature. They think that their teaching is innovative and effective, but they haven’t changed their practices that much at all. Driftwood professors are dedicated to their jobs and their students. It’s just that their professional training is out of date. They’ve drifted away, inadvertently, from the best that they can do. I’m not worried about becoming deadwood, but I do have to be viligant about becoming driftwood. You might be driftwood if your teaching relies on concepts that date back to your grad school days more than what you’ve learned since then. You might be driftwood if you have trouble publishing an article because no solid journal thinks that the topic is important. You might be driftwood if you are uncomfortable telling your students “I don’t know” because you fear that you are supposed to know. You might be driftwood if you’re avoiding a specific research agenda not because you lack the tools but because you lack the information. You might be driftwood if you find yourself disagreeing with most of the junior faculty about research standards or contemporary teaching approaches. You might be driftwood if you rely on skills you learned in grad school that aren’t being taught in grad school anymore. So, when people are coming up the pike with skills and ideas in which I’m not proficient, I’ve got to get on it. Thus my interest in inquiry based learning, and my need to learn R, and getting to know grad students in general. This much is sure: you’ve got to self-diagnose your own driftwood status, but it’s unlikely that anybody else is going to do you the favor. This doesn’t have anything to do with salary, promotion, reputation or recognition. It’s just about doing the best that you can. This entry was tagged professional development, seniority.